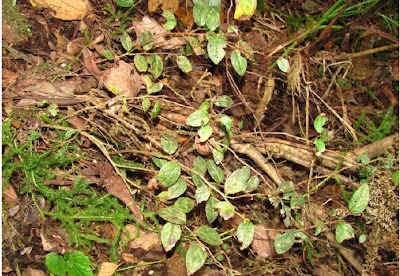 An ongoing road extension project near Aka Hills in Arunachal Pradesh in India may wipe out a rare medicinal plant found only in the Aka Hills, fears botanists working in the area. According to Dr. Subhasis Panda, an Assistant Professor at the Angiosperm Taxonomy & Ecology Lab at the Post-Graduate Department of Botany in Darjeeling Government College, the plant - Gaultheria akaensis - has been reported so far from the Aka Hills of Arunachal Pradesh only. It is found in moist rocks covered with humus at an altitude of 1800 meters. “Since its discovery in 2002 (December), only one small population observed near left bank of the Bridge, 3 Km from Nechephu 27 KM toward Tenga Valley in Aka Hill area. ”, he says. Now the population has declined. Field surveys conducted by scientists at the Botanical Survey of India and Forest Department of Arunachal Pradesh since 2002 have failed to locate a second population of the same race of the plant elsewhere, said he. According to him, the new Highway Extension project carried out by the Border Roads Organisation (BRO) in the area, threatens the only known habitat of the plant. According to a recent research paper published in the Journal of Threatened Taxa, the threats to the plant are multi-fold. The extension of the highway “has already started from the Bhalukpong area and is proceeding towards Aka Hill area.” says the study. Moreover, a hydroelectric project coming up in the area is also a severe threat to the existence of the plant, it says. According to the research paper, detailed explorations in the Aka Hills and neighboruing countries like Nepal, Bhutan and China has failed so far to report the plant. Currently, only two plants of the species are known to survive. Very less seed germination in the small population has already put the plant under threat while the habitat destruction has added to the rate of decline. However, according to botanists, another race of the plant is present in Darjeeling hills, though they are not the exact race found in Aka Hills. Diplycosia indica, a plant found in Darjeeling, was earlier believed to be a separate species, but later identified as another race of Gaultheria akaensis. According to Dr. Panda, who has made extensive studies on the plant, the Arunachal Population (Aka Hill race) is somewhat different to that of ‘Darjeeling race’. “Arunachal race has ovate to ovate-elliptic lamina, but Darjeeling race has elliptic lamina”, which make them different, he said. Darjeeling race of Gaultheria akaensis has 4 to 5 smaller populations observed till date (Lame Dura, Meghma, Gairibus, Kaiankanta). According to Dr. Panda, Lamedura population is somewhat larger with 15-20 individuals. Existence of different races does not decrease the threat to the Aka Hill race, say experts. There is a “need to conserve both races, but conservation of Arunachal race is urgently required”, says Dr. S. Panda. Aka Hills situated in the West Kameng District is inhabited by Aka tribes. The tribes use the plant for therapeutic purposes. According to the study in the journal, the tribes mix the leaf extract of the plant with that of another plant to treat rheumatic and sciatic pain. “Tender leaf extract [of the plant] mixed with G. fragrantissima leaves (1:1) applied to cure acute rheumatic and sciatic pain by the Akas”, says the study. Though the road project is yet to reach the area where the plants exist, the threat is imminent, say researchers. However, according to them, making slighter change to the present extension plan can help save the plants. Instead of going for the present extension project, BRO may try repairing the earlier road stretch, suggests the researcher. “As the whole Aka Hill area is harbouring more than 500 Threatened taxa, so for the purpose of effective conservation, BRO should avoid road extension from SESSA to JAMIRI (40 KM), instead they can repair the earlier road without extension”, said Dr. S Panda. The presently proposed extension works may damage this area of high biodiversity significance, he added.